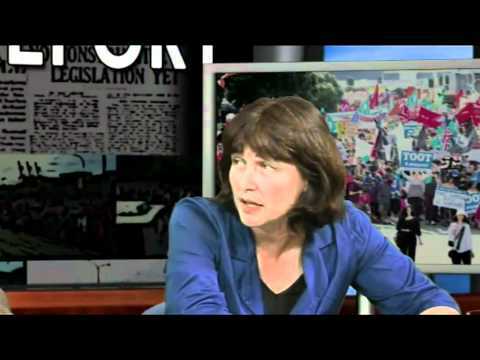 THE UNION REPORT 23 April 2012: The Union Report: Guests are Helen Kelly and Garry Parsloe. Topics are Issue 1: What is driving the conflict at the Ports of Auckland, where is the middle ground and how many dirty tricks does PoAL need to play? Issue 2: AFFCO says they want the Union out of their industry, will these tactics enshrine a low wage economy and if our primary industries can’t provide decent wages, what industry can? Issue 3: This Saturday is International Worker’s memorial Day and 6 months since the death of Charanpreet Dhaliwal on a Fulton Hogan worksite. Is a de-unionized workforce a safe workforce? There is huge opposition to the government’s plans to privatise state assets. Electricity is already too expensive in this country- we remember when Folole Muliaga died after she was disconnected for getting behind on her bills. Mums and Dads can’t pay the bills on the poverty wages they earn, let alone buy back what they already own. Its not just American and Australian multinationals and the Chinese State we’re worried about- Our concern is that the government will sell off the family silver to their rich friends, the elite 1%, both domestic and international. We want to mobilise thousands of people to march on the streets of Auckland to say Aotearoa is not for Sale. We will bring together the political Left with union and community campaigns, such as the GI Tenants resisiting eviction and the Wharfies fighting casualisation. Our public assets, our schools, our jobs and our homes are all under attack. Its time to draw a line in the sand and defeat the government on the streets." New Zealand is for sale. Come to the demonstration on Saturday April 28th to defend Aotearoa or join the Hikoi as it comes to your area. View One News story on the hikoi. Endorsed by Labour, Greens, Mana, NZ First, Unions Auckland, the CTU Runanga Kaimahi Maori, Greenpeace, the Unite Union, the EPMU, MUNZ, Actors Equity, the First Union, New Zealand Nurses Organisation , the Service and Food Workers Union, the Post Primary Teachers’ Association, NZEI Auckland, the Manufacturing and Construction Workers Union, Grey Power, the Working Women’s Resource Centre, Auckland Action Against Poverty, Global Peace and Justice Auckland, Occupy Auckland, the Hikoi to stop Asset Sales and Socialist Aotearoa. Aotearoa is not for sale march facebook event page. John has been a Unite organiser for over six years and in that time he has handled many of the more difficult negotiations, companies, and employment cases. The main areas of work he covered included security, English language schools, health, and call centres. And he was always there to support members in other areas covered by Unite and other working people. Many of our members from outside of Auckland have also got to know John as he has coordinated our employment relations education training – putting together courses, doing schedules for training days, presenting courses and travelling to other cities to run training days. More recently John stood in the general elections for the MANA party and will continue to be active in Global Peace and Justice Auckland. So he will continue to be around our union in all sorts of social justice struggles. “John has been a wonderful rep and has been quite a force to reckon with throughout the time he has represented those of us at First Security in particular, over the last 4 years. While the environment is quite challenging and we have had some stand-off moments, John has still managed to forge a working relationship with management and has put us well on the road to enriching that relationship ever more. The respect and integrity and mana that he has, will always be imbedded in those that have had to deal with John. We will miss him and his expertise and hope that he lingers around long enough to impart some of that wealth of knowledge onto those that will follow in his footsteps. From all of us. Kia waimarie, Mauri ora Kia ora, Much Aroha.” – Agnes Devon, First Security delegate. “I first met John a little over 6 years ago. My workplace had just signed up with UNITE and we were waiting to be allocated an organiser and to negotiate our initial CEA. This mild-mannered, warm, friendly guy showed up to discuss our first set of claims and reassure us that our jobs would not be lost for joining the union. Needless to say John achieved a significant pay rise and improvement in working conditions from the following negotiation process and has continued to achieve wonders each year for us (and of course no one was fired). It has been a huge privilege to have been able to work closely with John on numerous occasions and I have seen him make a huge difference to the lives of union members in all the sectors he represents. In a nutshell John Minto is a good man in the truest sense and his departure will leave a very difficult void to fill. Me te mihi nui.” – Alex Pirie, EF Language School delegate. As well as being a dedicated activist, John has also been a school teacher for most of his life and he is returning to that role. John has played an important role in establishing Unite for which we thank him. Recently there have been news stories about the use of cameras in the workplace. Our delegates and members are aware that some companies use camera surveillance. While the union is not generally in favour of increased surveillance it is important for members to be aware of the rules. The rules for the use of surveillance at work come from the principles and intentions of The Privacy Act 1993. Here are five points about surveillance. 1. Any company wishing to use camera surveillance must take reasonable measures to make sure that you know that cameras are being used to collect information in the workplace. However there are exceptions to this if an employer has reasonable grounds to believe a particular illegal activity is occurring and making staff aware of the operation of cameras would undermine their use. 2. The information collected cannot be personal information about your private life – it can only be about you in so far as it relates to your obligations in the workplace. It cannot be used for anything other than what it is intended to be used for. 3. You can have access to any information (footage etc) collected about you. One example of this is that an employer can’t say in a disciplinary that an alleged misconduct is on camera without agreeing to provide footage if asked by your representative. 4. Anything presented must be current and complete (meaning you should ask for dates of any information presented and footage from before and after alleged offences) and cannot otherwise be misleading. 5. The Employment Relations Act 2000 also has a bearing on the use of surveillance because it requires a duty of good faith from your employer, meaning there should be no misleading or deceptions. However covert/hidden surveillance can still be used if the employer has acted in good faith by forming a policy on covert surveillance and informing employees of that policy. Note: Some of the information here is sourced from Hesketh Henry Employment News, March 2012, but has been significantly altered for the purposes of this newsletter. As advised in the December newsletter, the maximum fee in the fast food and cinema sectors has risen to the same as other members of Unite – to $5.50 per week. This only affects those who in restaurants and cinemas earning above $435 a week and took effect from the 1st April. The union fee is calculated at 1.1% of wages with a minimum of two dollars and a mazimum of $5.50. This still makes Unite the best value union in the country. English Language schools, Qantas Airways call centre, Waikato DHB , Events and Hoyts cinemas, Burger King, McDonald’s, Wendy’s, Restaurant Brands, First Security. Members at EF English language school have received a 3.5% increase in their new union contract which has a one year term before expiry. At the Embassy English language school Unite signed off on a three-year deal which will increase pay by 3% in the first year and 3.5% in the second year, then on the third year it will increase by a further a minimum of 3% but it will increase by more if inflation is higher than 3%. Between 80 and 90 members employed by Qantas at its call centre have achieved and ratified their first ever union agreement. It is a three year deal which gives 3% increase on wages and allowances for each year and is also back-dated for a significant period to June 2011. Many conditions have been clarified and during negotiations a significant problem was uncovered in that the large pay bands were not working with far too many staff at the bottom of the band. Unite and the company have agreed to resolve the problem during the course of the agreement. In February Unite signed off a new agreement based around the national Terms of Settlement which applied to a group of unions with smaller contracts at the DHB. Highlights of the agreement are an additional week of leave for those with 5 years’ service, a one-off payment of $100 in February 2012, a one-off payment of $750 in April, and then a 2.5% increase on rates halfway through the agreement. The first negotiation session has been held with the Events and Hoyts cinema chains. Readings will be negotiated mid-year. Union claims include higher wages, guaranteed hours, and improved benefits. Unite has initiated bargaining again with Burger King. This means the company has to negotiate a new agreement with Unite. After last year we hoped that this company would stop keeping nearly all its staff on the minimum wage. However that was not to be the case. From April 1 the $13.50 legal minimun wage is being applied to all staff up to level 3 proficiency. Team trainers & maintenance will be on $13.75 and Production Service Coordinator’s on $14. These are the lowest wages in the fast food industry. If we are going to improve these wages we need union members at BK to start getting actively involved in Unite and the negotiations planned for later this year. Because there was a Collective Agreement already in place at McDonald’s there has been an automatic increase of either 50c or 3.85% on all pay rates from April 1. The full agreement gets renegotiated next year. Unite’s union agreement with Wendy’s stipulates that all rates increase by the same amount as the minimum wage. This means there will be a 50 cent an hour increase from April 1. We have initiated bargaining with the company so there will be claims meeting soon to hear from members what changes they want in the agreement. Negotiations with Restaurant Brands (KFC, Pizza Hutt and Starbucks) got off to a rocky start with the company asking for takebacks. The company wants to reduce the break time to 10 minutes, introduce 2 hour minimum shifts at KFC, and only increase wages for most by 1.5%. The union is asking for $15 an hour, guaranteed hours and penalties if workers miss their breaks. The company is claiming it needs its take-backs to increase its profitability. On the second set of negotiating days (April 12 and 13) the company didn’t move from its 1.5% pay offer. There was a suggestion that there may be a little more on offer for KFC members only but not much. Unite will be going through a process with the membership and a survey is being distributed to members to complete (go to unite.org.nz to see the online version). Unite doesn’t view the offer as worth taking into formal ratification meetings because the company usually offers a percentage which either covers inflation or is the same percentage movement as the minimum wage. Unless the company improves its offer there could be problems in store for this brand. NOTE: We have produced and will continue to produce more detailed special newsletters and emails to keep members at RBL informed of bargaining progress. In March Unite concluded a new agreement with First Security. It is a 13-month deal from January 1, 2012 through to January 31, 2012. It includes a 2% increase on all paid rates which have been backdated to January 1, 2012. There was also a negotiated one-off payment of $100 for union members. There were also some good improvements on conditions of employment. Patrol offices are now entitled to an extra $100 allowance for each occasion that they are required to do a double-run (i.e. cover two areas in one shift). There is also a new employee well-being clause. Where there were few procedures before, the employee well-being clause now ensures there is a process to follow when a guard has been assaulted or suffers and injury at work. Another contentious issue has been employee deductions; there is now a clear process of consultation for instances where the company wishes to make an authorised deduction from employees pay. Some major employers are running an attack against the conditions of working people throughout the country. The Ports of Auckland employers and Talley’s-owned AFFCO bosses both say that they want greater ‘flexibilisation’. When these types of employers say they want flexibilisation they don’t mean that hours of work should be made more flexible in a way that suits workers. The flexibilisation they speak of is the type that means workers have to scramble for hours, compete for hours, and ring in over the phone to see if there is work for them. When they say flexibilisation they mean ‘casualisation’. Our union in particular has a strong record of campaigning against casualisation because we set out to organise amongst many types of workplaces that have became more casualised since the 1990s.Our position is clear. Our members need secure hours of work each week, our members need secure jobs that can’t be unfairly taken away from them, and members need income security for if they are in a situation where they don’t have a job. We will continue with our objective of opposing casualisation with campaigns and negotiations. Over the next period working people need to be very astute to protect income and conditions. It starts here with supporting union initiatives at your workplace and another big part of this is supporting other workers whose employers are attempting to casualise them. Auckland Port workers were able to beat back a Port company attempt to sack the entire workforce and replace them with contract workers on much worse wages and conditions. In the process they wanted to destroy the union that represents port and maritime workers. If the bosses had succeeded all workers would have been put on the back foot. That is why there was tremendous international and national solidarity with the port workers. The bosses were having difficulty getting any ship loaded in Auckland or unloaded anywhere else in the world. The struggle continues with the company saying it still wants to contract out jobs and achieve greater flexibilisation. Upon return to the workplace union members were told they weren’t allowed to display union logos but members are standing strong. The Talley’s family acquired 100% ownership of AFFCO in 2011. Many AFFCO workers say that they were expecting trouble when they heard Talley’s had made a successful bid. That’s because Talley’s has an extremely anti-union history. It includes lobbying for changes which led to the 1991 Employment Contracts Act 1991, illegally using scab labour during a lockout in its Open Country Cheese factory in the Waikato, and asserting that men are better for filleting fish while women are more suited to pole dancing after they lost an equal opportunity employment case. Just under 1000 AFFCO meat workers have been locked out at nine North Island plants. As with last year’s CMP/ANZCO lockout, the union had not taken strike action – the company has simply locked out the workers because they don’t want to accept significant cut-backs against their conditions. This is the type of employer aggression that does serious damage to whole communities. Union workers who haven’t been locked out have taken limited strikes to put pressure on the employer. In order to win the dispute the workers need money to sustain themselves. Two days of negotiations on April 12 & 13 failed to reach an agreement on a new Collective Agreement. There are five major areas of disagreement. The company has not moved from its 1.5% pay offer. There was a suggestion that there may be a little more on offer for KFC members only but not much. The start rate would move to from $13.13 to $13.50 (2.8%) but only because the minimum wage rose to that level. This is a long way from the $15 an hour start rate being asked for and does not even match the usual increase each year which in the past has at least matched the movement in the minimum wage which this year was 3.85%. The offer is for a minimum of 25 hours for LAS qualified after three years. We asked for a guarantee of hours after one year for Gold Star or higher. We suggested that a regular roster should have been established by one year which could be protected. In that case we accepted that the minimum could vary according to availability. We were disappointed that there was no response at the negotiation to a small practical suggestion that when a store plans to hire new staff it posts a notice on the board asking for volunteers for the available hours and shifts. It is our view that some Restaurant Managers keep too many staff on their books to maintain the maximum “flexibility” in their rostering when the priority should be maximising the regular rostered hours for existing staff. The company continues to ask for a change in the breaks from 15 to 10 minutes. We argued that 15 minutes was an established norm in the industry that reflects the fact that workers are on their feet the whole time and have restricted options of where they can take their break or how they can access or heat food. There was progress however on getting breaks and that these should be in the middle of the work period that applies. We want the free meal and other discounted food while on shift to be in the Collective Agreement and not solely at the company’s discretion. We understand they brought in the “It’s our Shout” policy just before we started negotiations to undermine the union bargaining and it is not guaranteed into the future. The company is continuing to ask for a minimum shift length of 2 hours at KFC. We think this would be a major step backwards for KFC workers and would create shifts where you hardly make any money once time and costs of travel to and from work are calculated. WHAT CAN WE DO TO SHIFT THE COMPANY? We need a strong message to the company that the current offer is not good enough. We are circulating a survey of members to get your opinion. Please fill this out as soon as possible and pass it back to your delegate or local union organiser. It can aslo be faxed to 09 8469509 or emailed to support Included in the survey are the issues you consider most important and what you are willing to do to get it. This includes the possibility we may have to take industrial action to support our claims. All members of unite working at any Restaurant Brands store are legally entitled to take industrial action in support of our claims. Any collective action we take is legally allowed and you can’t be disciplined for taking such action. Six years ago thousands of Restaurant Brands members took action to get our first Collective Agreement. It may be we need to take action to improve things today. Doing a “go-slow” or “work to rule” at work. Stopping work for short periods (15 minutes to two hours) over the busy lunch and dinner times. Taking your breaks together when you choose. Coming to work late or not coming at all for a shift and telling the company you were on strike when you get to work that day or the next. Having a few key staff (cooks, supervisors, managers) take action together on a shift while others keep “working”.